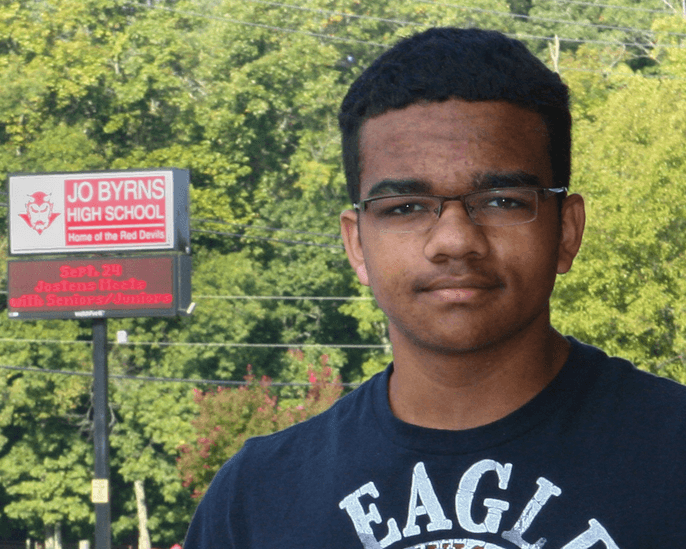 Jo Byrns High School student Justyn Emmons performed a heroic feat on Saturday, Sept. 7, when he unhesitatingly dove into a local lake to prevent a young child from drowning. Emmons was part of a church outing and was also fulfilling some of his community service requirements for his Air Force Junior Reserve Officer Training Corp program at Springfield High School. During the regional camp activities, an 8-year-old camper fell from a zip line into the lake and experienced difficulties staying afloat. The child, who could not swim, had selected a personal flotation device that was too large, and was slipping out of the device and calling for help. Hearing the child’s cries, Emmons ran to the closest shoreline, dove into the water, swam out and retrieved the child, bringing him back to shore, where he handed him to others before getting out of the water himself. Emmons said he had no second thoughts about the rescue, but simply did what he saw needed to be done in order to prevent a potential loss of life. His quick thinking and prompt action were critical at a time when seconds counted. As a freshman in high school, Emmons is in his first year of Jr. ROTC and aspires to an eventual Air Force career as a pilot. Story from the Robertson County Schools…..
As a sub. teacher for Robertson County, I was so happy to the read story of this brave young student saving a child’s life. We see and hear so much about our young students that is not very good at times, but this young man was raised with strong values, morals, respect, and honor for his fellow man, and has a wonderful future ahead of him. As the son of an Air Force/Army veteran, and cousin of a retired US Air pilot, I hope Justyn’s dream of coming a pilot will come true! JOB WELL DONE!!! Mr.McKisic, i know this is two years later but i want to thank you on your comment sir. Even tho i will not be continuing in the AIr Force i will be looking toward the Army Special Forces for a career. For your information i wanted to tell you that i finished four semesters of JAFROTC ending it as a 2nd Lt. . Once again thank you for your comment Sir.